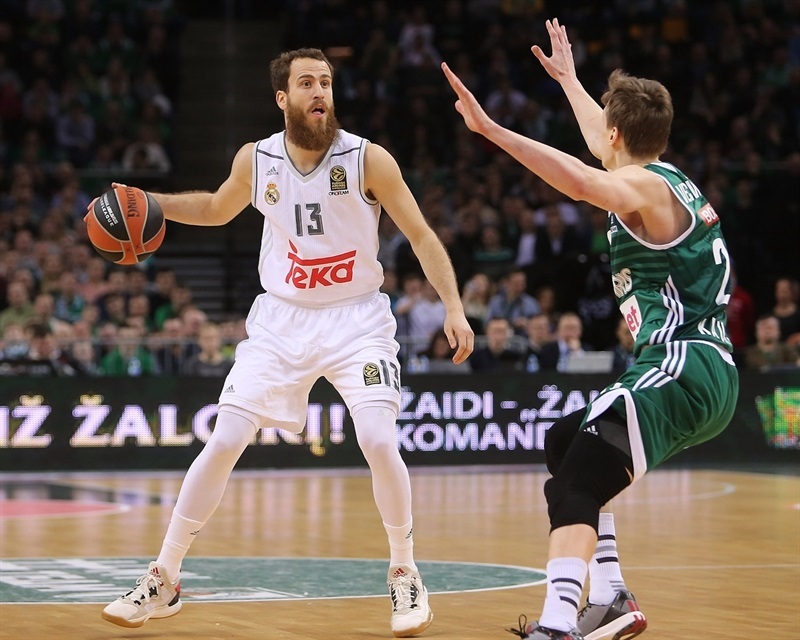 Andres Nocioni recorded one of the best shooting nights in Real Madrid history to help the reigning Turkish Airlines Euroleague champs to a 75-90 come-from-behind road win over Zalgiris Kaunas. Nocioni was perfect on 6 attempts from behind the arc to tie the club record for the most accurate three-point shooting game. 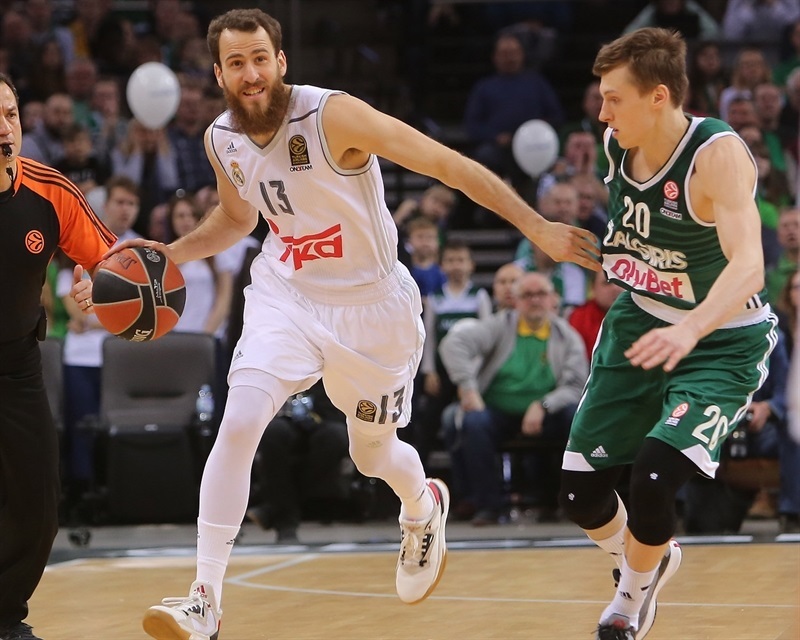 He finished with 22 points and 7 rebounds as Madrid improved to 6-4 to take over third place in Group F. Zalgiris fell to 2-8. The hosts started strong and led by as many as 8 in the second quarter before Sergio Llull’s three on the halftime buzzer cut the gap to 41-39. Then Los Blancos used a 2-13 run to finish the third quarter and Nocioni buried 4 threes in the fourth as his team pulled away. K.C. Rivers added 14 points, Felipe Reyes posted 10 points and 8 rebounds and Sergio Rodriguez tallied 9 points and 8 assists for the winners. 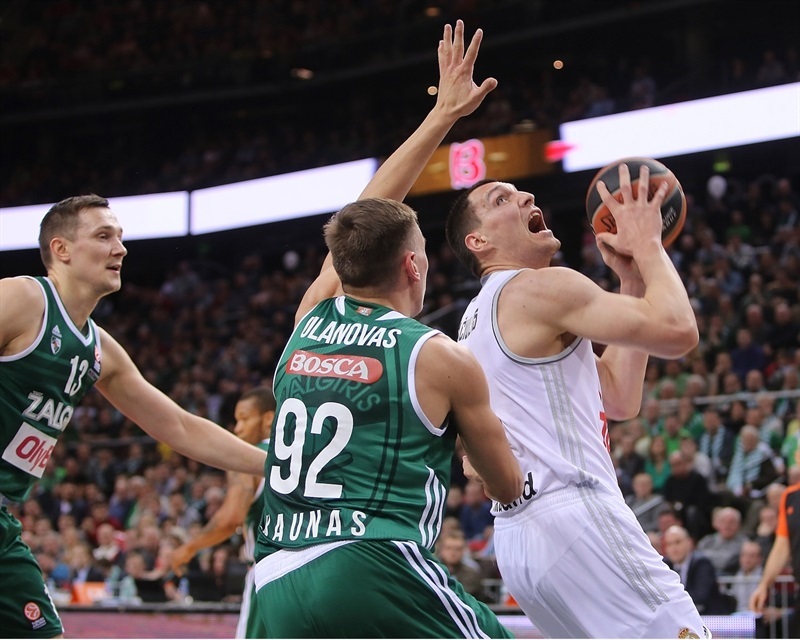 Paulius Jankunas collected 21 points, 8 rebounds and 4 assists and Ian Vouigioukas scored 13 for Zalgiris. Edgaras Ulanovas started strong for the hosts with a three-pointer and a layup in transition. 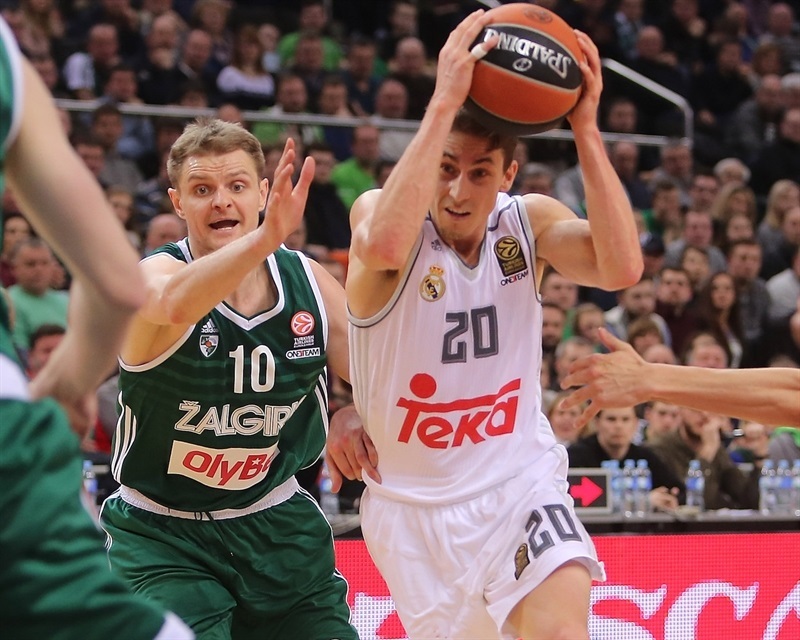 Jaycee Carroll’s no-look dish to Gustavo Ayon got Madrid on the scoreboard. 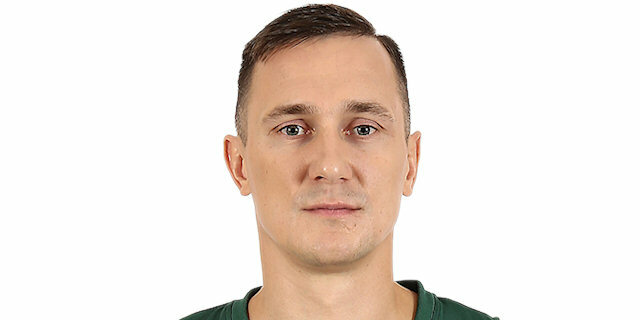 Martynas Sajus and Ayon traded layups. Jankunas fed Sajus for an easy layup and a 9-4 lead. Sajus remained a factor by rejecting Llull, but Reyes’s well-placed pass found Jonas Maciulis for an alley-oop layup. Jankunas buried a pair of jumpers, though Maciulis countered with a triple in between. Sajus denied Ayon with a chase down block on the break, but soon Maciulis scored, was fouled and missed the free throw, but Reyes took the rebound and put it in to tie the game at 13-13. Jankunas’s bounce pass to a cutting Vecvagars beat the Marid defense for a lefty layup and Vouigioukas sank a hook shot for a 17-13 lead after 10 minutes. Rivers nailed a jumper for Madrid and Vougioukas banked in a shot at the other end. After Ayon split free throws, Vecvagars’s three-pointer put Zalgiris ahead by 6. Rivers countered with a triple, but after a timeout, Siim-Sanders Vene made a big impact with a pair of jump shots. Augusto Lima tipped in a Nocioni miss, however Randle took charge for the hosts with a bank shot and then a steal from Rodriguez. Olivier Hanlan split free throws to make it 29-21. Rivers connected from downtown and Nocioni split free throws. Vene banked in a shot before a Nocioni three brought the visitors within 5. After a long jumper by Randle, Llull got to the line for his first points. Jankunas scored over Nocioni in the lane, but then fouled Nocioni on the other end. The Madrid forward missed both free throws. Hanlan’s free throws with three minutes left in the half gave Zalgiris a 37-30 advantage. Rivers reached 10 individual points with a mid-range jumper and Reyes tacked on 2 free throws. Martynas Pocius hit a jumper with his toe on the three-point line. Jankunas and Rivers traded shots and then Llull beat the halftime buzzer with a triple to bring the champs within 41-39 at the break. Randle was able to thread the needle with a pass to Vougioukas for a layup. Reyes and Jankunas traded baskets before Maciulis followed in a Llull miss. Madrid tied it at 45-45 on a Carroll layup from an inbounds play. Jankunas sank a jumper and Carroll countered with a floater. Randle nailed a jump shot to give the hosts a 49-47 edge midway through the quarter. After the TV timeout, Ayon evened things with free throws. Jankunas continued his strong night with a baseline drive and layup, but Ayon did even better with a basket-plus-foul. Reyes’s chippie shot gave Madrid its first lead, 51-53. Reyes used a spin move to notch a layup, however Hanlan countered with a layup. Ayon denied Hanlan with a block and Rodriguez buried a three in transition for a 53-59 Madrid lead. The shots stopped falling for the hosts and Nocioni drilled another three-pointer as the visitors finish the quarter up by 9 on a 2-13 run. 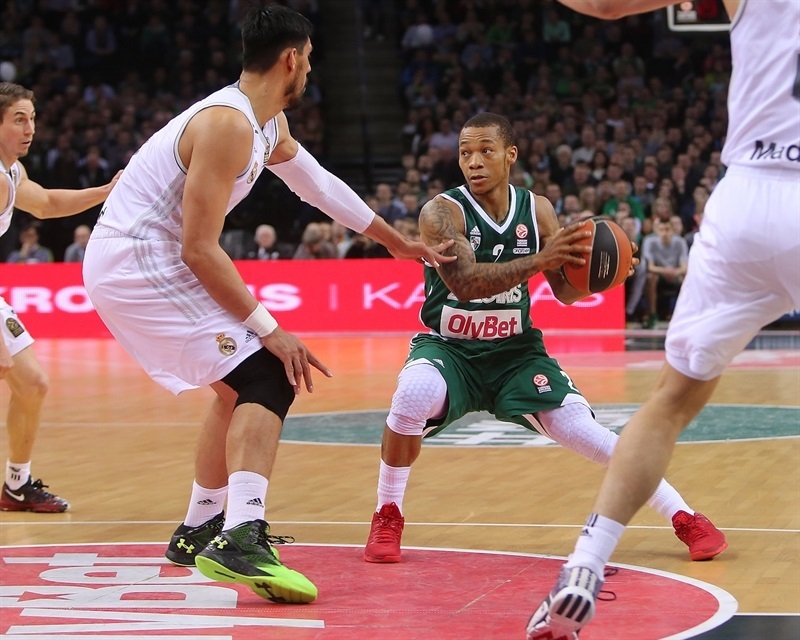 Vougioukas gave Zalgiris confidence with a three-point play and Hanlan followed with a fast break layup. Rivers drained a jumper. Hanlan got to the line, but missed both free throws. 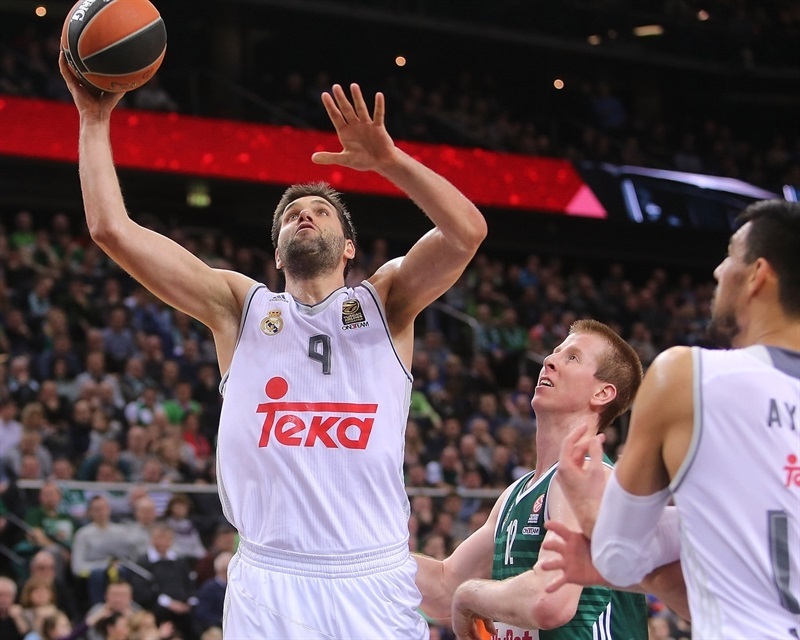 Vougioukas went by Ayon for a hook shot, however Nocioni’s third three of the night gave Madrid some breathing room. 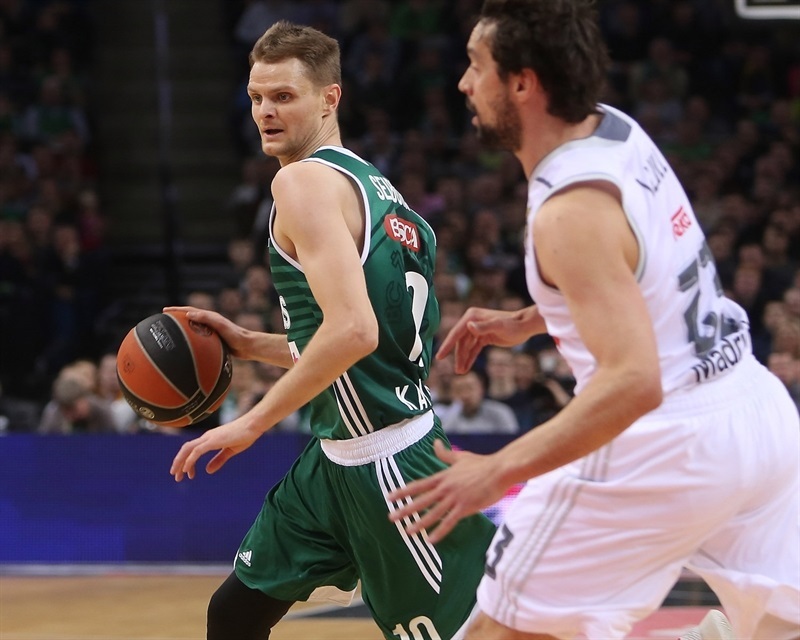 Jankunas sank free throws to bring Zalgiris within 62-67. Lima fought for a tip-in and Rodriguez found Nocioni open for his fourth triple and a 10-point lead with five minutes to go. Vougioukas hit a pair of free throws, but Lima muscled his way to a basket inside. Nocioni was fouled attempting a three and made the resulting 3 free throws for a 64-77 cushion. Randle scored a tough layup, but Madrid kept the pressure on with a foul drawn inside and a free throw made. Renaldas Seibutis hit a jumper and Jankunas narrowed the gap to 8 with free throws. Rodriguez split free throws and then nailed a triple to all but ice the game. Jankunas scored a put-back, but Rodriguez made 2 more free throws. 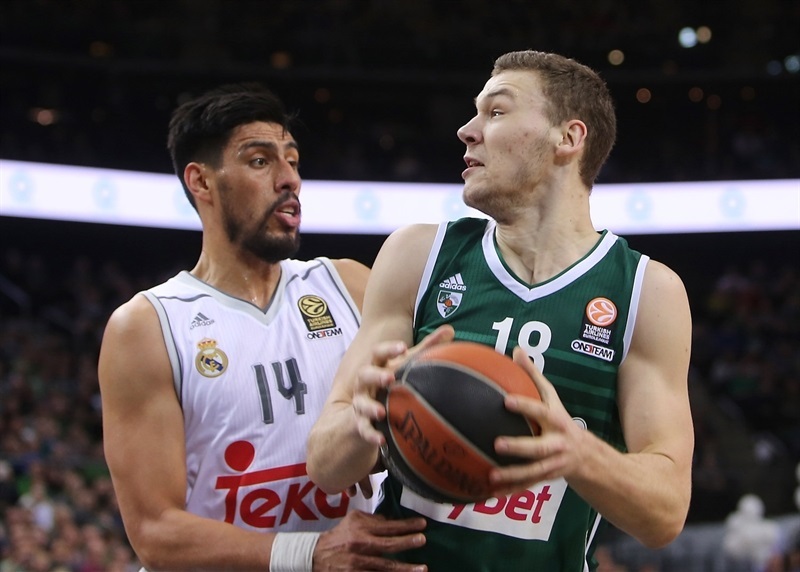 In the final minute, Jankunas added another free throw to his tally and Nocioni converted his fifth and sixth threes to seal the Madrid victory. "I‘m disappointed we couldn‘t bring more intrigue at the end of the game. We fought hard, but we had shooting struggles. We trained hard on shooting, but the ball wasn‘t falling. I know guys are working a lot on it; we were unlucky. 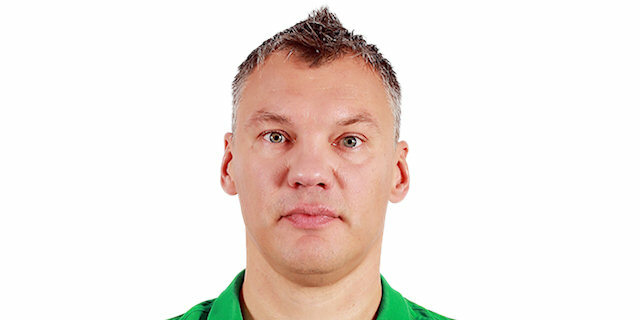 I‘m happy about our opportunities, situations to take shots. Our struggles began when the opponent switched defenses. At some points we needed more discipline and to shoot the ball better." "First, defensively we made some changes, some adjustments, at halftime that cut their rhythm in offense. That way we controlled their one on ones and we controlled the boards better in the second half. And then offensively we were able to look for better shots, better extra passes and like I [said] at halftime, we needed a good [shooting] percentage and we hit key shots to win the game. Somehow the game we knew was going to be long because they’re a team that fights until the end. And we knew we had to rotate players, use everybody, play with energy, our moment will come and I tried to emphasize that. Make sure we have the energy till the end, that is when the game is going to be decided. " "It was a close game until the third quarter. Then opponents got away and built a 10-point lead. We made mistakes in defense, had problems defending the pick and rolls; they moved the ball very well. Real Madrid felt more freedom and started to make shots from the paint and downtown. When they gain a double-digit lead, they know how to play and it‘s very hard to make a comeback and take the lead back." "I think we played a smart game. We tried to play hard in defense. I think in the first quarter we didn’t. And then in the second half we leveled off the level of the game. We played much better and we made shots. That’s it. [Paulius Jankunas] is a tough player. 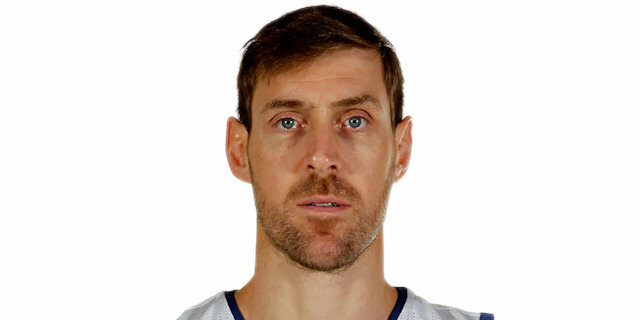 He is an old guy who has a lot of experience in the league. He is a really smart player. We tried to do the job. We played hard. "